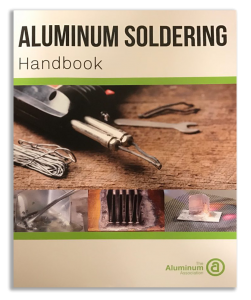 We are pleased to announce that two of our employees, Dr. Y. Baskin (President) and Bill Avery (Joining Specialist) worked hand-in-hand with The Aluminum Association to create the newest edition of the Aluminum Soldering Handbook. This new handbook is an indispensable guide for successful aluminum soldering. Please contact The Aluminum Association or Superior Flux for information about the new Aluminum Soldering Handbook. In fact, the Aluminum Association and Superior Flux created the Aluminum Soldering Handbook to teach you how “doable” aluminum soldering is. Granted, soldering aluminum is not as easy as soldering copper, for example; this is because Aluminum creates tenacious oxides that want to come in the way of effective soldering. But that’s where flux comes into the picture. But by using the right aluminum soldering flux and the right solder alloy, and by using the correct soldering tools and temperatures, you can achieve successful aluminum soldering. Keep in mind there are many different types (or series) of aluminum, and not all can be soldered. However, many of the commonly used aluminum series, such as 1000, 3000, and 6000-series aluminum can be soldered if the right flux/solder combination and the right process is used. The Aluminum Soldering Handbook should open your eyes to the many possibilities in aluminum soldering, including fluxes, solders, cored wire, aluminum solder paste, and more. The Aluminum Soldering Handbook delves into pre-solder preparation of the aluminum, as well as post-solder cleaning of the aluminum to remove any potentially corrosive flux residues. The handbook describes various fixtures and joint design for practical assistance in aluminum soldering. The handbook also goes into detail on the various types of soldering methods that can be used, including torch, iron and hot-plate soldering, as well as other methods, such as furnace soldering, induction, dip soldering, etc. Once you’ve soldered, how do you know if the joint has integrity? Consult the Aluminum Soldering Handbook, which offers details on various methods of joint inspection, testing and performance. Also, check out our website’s many informative web pages that focus on Aluminum Soldering. Nihon Superior & Superior Flux, Old Friends!